Hundreds of realistic practice questions and exercises to prepare you for the verbal portion of the GRE. 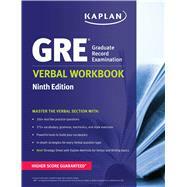 Kaplan’s GRE Verbal Workbook, 9th Edition, comprehensively addresses the Verbal Reasoning and Writing sections of the GRE Revised General Test. This workbook is a highly effective way to prepare for the verbal section of the GRE Revised General Test. The most essential information on the GRE from the leader in GRE preparation. Kaplan gives you everything you need to boost your Verbal score on the GRE, including the most effective strategies, comprehensive practice, and tools to conquer every question on Test Day. Kaplan is dedicated to the success of our students. We guarantee students will score higher on the GRE—or get their money back. Celebrating 75+ years as the world leader in the test prep industry,Â Kaplan Test Prep (www.kaptest.com) is a premier provider of educational and career services for individuals, schools and businesses. With a comprehensive menu of online offerings as well as a complete array of print books and digital products, Kaplan offers preparation for more than 90 standardized tests, including entrance exams for secondary school, college and graduate school, as well as professional licensing exams for attorneys, physicians and nurses.Â Kaplan also provides private tutoring and graduate admissions consulting services. Questions about what youâ€™re studying?